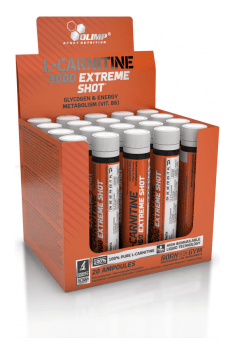 Olimp L-Carnitine 3000 Extreme Shot is a preparation that simultaneously provides L-carnitine and vitamin B6 in the form of convenient ampoules. The supplement effectively supports fat burning and boosts energy, thus increasing the body's exercise capacity. The supplement uses an innovative Liquid Technology formula to maximize the rate and effectiveness of the absorption of the active ingredients. The form of a handy ampoule makes it easier to take the supplement at any time without having to take capsules or tablets. L-carnitine is an organic compound that is synthesized in the liver and kidneys from lysine and methionine. It was isolated for the first time from muscles, where it occurs in the largest amount due to the functions performed. Carnitine is sometimes called a vitamin-like compound because it can be produced by the body and supplied with food. The most biologically active L-carnitine can be found in meat, mainly beef and pork, as well as in fish and in smaller quantities in poultry meat. L-carnitine plays the role of fatty acids transporter through the internal mitochondrial membrane. It binds to them with an ester bond, which, after transferring the acids to the mitochondrion, undergoes hydrolysis, whereas the carnitine itself can perform its functions again. L-carnitine takes part in the beta-oxidation of fatty acids, which leads to their decomposition and the production of large amounts of energy. This is of great importance for the more efficient utilization of fat catabolism products and provides a greater supply of energy, which is a great advantage for people who want to get rid of extra pounds faster and improve the efficiency of their body, for example during strength training. This is the reason, why carnitine supplementation is extremely important. It is worth knowing that even after a short-term effort, as much as up to half of the carnitine initially available in the muscles decreases. In addition to the beneficial effects of carnitine on the processes of obtaining energy from fatty acids and increasing the body's performance during training, L-carnitine also has beneficial effects on the nervous system. As reported by scientists, L-carnitine improves thought processes and remembering and makes the transmission of nerve impulses between neurons proceed more efficiently. This is because carnitine is involved in the synthesis of acetylcholine – a neurotransmitter which is also responsible for proper muscle contraction. L-carnitine deficiency may cause weakening or atrophy of muscles, and may indirectly lead to heart failure. Although such situations occur in malnourished persons or due to other diseases, associated with losing large amounts of carnitine via kidneys, linking these ailments with the lack of L-carnitine only emphasizes its key role in maintaining healthy and well-functioning muscles. Vitamin B6 (as pyridoxine hydrochloride) is an exogenous compound that is a coenzyme necessary for the transformation of macromolecules such as amino acids, fats, and carbohydrates. It also participates in the synthesis of prostaglandins and the proper functioning of the heart and nervous system, as well as in the maintenance of normal blood pressure. Vitamin B6 also accelerates the absorption of L-carnitine and shows a synergistic effect with it, thus promoting faster energy formation in the mitochondria. In summary, Olimp L-Carnitine 3000 Extreme Shot is a supplement supporting the functioning of muscles and increasing their efficiency by promoting the acquisition of energy from fatty acids. Vitamin B6 additionally enhances the activity of carnitine through a synergistic action. In addition, this supplement is in the form of ampoules, which ensures the convenience of its use and maximally speeds up its effects. Take 1 portion, i.e. ½ ampoule (12,5 ml) 2 times a day: 30 minutes before a meal and training. Shake before use. On non-workout days you may not take the product. Taking an l-carnitine preparation may become even more effective when we combine it with other products containing choline, caffeine or alpha-lipoic acid. A standard dose of l-carnitine is 500-2000 mg. Using half an ampoule may contribute to the appearance of the desired effect, however, to maximize it, use 1 ampoule a day, especially on training days. Water, acidity regulator: citric acid, sweeteners: sucralose, acesulfame K, preservative – E 202, aromas, colour: beta-carotene.